At 1:59 a.m. Matt and I were awakened by cries coming from Little’s room. I realize that in many households this is not unusual, but when it happens around here you can be pretty sure that there is a problem. Matt jumped out of bed, literally, and went to Little’s rescue. It seems that she had her leg stuck between the slats on her crib and when she moved the rest of her body that leg just wouldn’t come along like it should. Her Daddy gently freed her leg and then picked her up to comfort and reassure her. She went back to sleep pretty quickly; it took me a while. When I’m having trouble going to sleep I often pray. As I lay there in the dark praying I thought about how our Father is always there; it doesn’t matter what time of day or night we call out, it doesn’t matter if we’ve just talked to Him or if it has been awhile, it doesn’t matter if it’s the time we usually talk to Him or if we’re calling out in fear, discomfort, pain, desperation. He is always there with open ears, open arms, an open heart. He is always there to pick us up, to comfort us, to reassure us. In the market for a vacuum? I hear that Dyson vacuums are wonderful, and I have thought that it would be great to have such a hardworking vacuum. It does do all the work itself, right? Anyway, Janice and Susan at 5 Minutes for Mom are giving all of us a chance to win the new Dyson Slim model. If you are interested, head on over to their place and check out the contest rules. Have you ever had one of those days (or weeks, months, or years) where the same topic seems to come up over and over again in various forms and in various situations? I’m having one of those seasons, and the topic seems to be discipline and self-control. It all started back at the first of the year when I was convicted of my need to set some goals. Let me make it perfectly clear that, although I wrote them out, I have lost site of said goals – as well as the paper on which they were written. Coincidence? I think not. Over the last few months I’ve received gentle reminders, repeatedly, that I might need to buckle down in some areas. Over the last few weeks the nudges are getting a little less gentle. I did make an attempt with my spending hiatus, which has gone pretty well; but I really feel like I’m being called to look at and work on my self-control across many areas of my life, not just my discretionary spending. So, I am going to make a new list of a few things that I would like to accomplish or get better about doing over the next few months. Hopefully, I can manage not to lose them this time! I know God has something to teach me through this, or something he is calling me to do. As I strive to get better in these areas I will continue to pray through it and pray for strength and determination. Do you have any goals you are working toward? Is God calling you to greater things? Yes, it is about books once again; as you know, I *heart* books. One of the things I enjoy about the mommy-blogging realm is that I can always find new book recommendations; my “to-read” list is longer now than it has ever been. And now, Katrina at Callapidder Days is hosting a Spring Reading Thing. 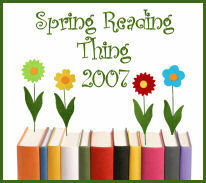 The challenge goes from March 21 through June 21 (thus, spring reading thing). To check out what others are reading and to get some book ideas for yourself click on the logo above. I thought I would join in and set some reading goals for myself; I’ve chosen 4 non-fiction, 5 fiction, and 6 books of the Bible. I reserve the right to add to, change, or alter this list at any time and in anyway over the next 3 months. To check out what others are reading and to get some book ideas for yourself click on the logo above. - I have not organized Little’s closet. - I realize that I can go a few weeks without buying clothes or shoes. Note:There are the seeds of several posts sprouting in my mind right now. The hard part is getting them developed and written in a cohesive and comprehensible fashion. Hopefully this means I’ll be posting regularly the next few days, but that is always dependant on life with Little. This is currently my life quote. It spins through my head several times a day; especially if I see or hear the word glory or satisfaction. As I seek to glorify God in all things I realize that it is something best accomplished by satisfaction – being filled daily by the presence of God. I am currently involved in a Bible study called Living Your Life as a Beautiful Offering by Angela Thomas. In this week’s lesson (on Matthew 5:6), Angela defined righteousness as, “the right living that comes out of your desire for God.” Based on this definition, my desire for God leads directly to Him being glorified in my life. If my main God-given purpose in life is to glorify God, then this leads to a “life loop” – I hunger and thirst for righteousness; I am filled to satisfaction by Christ; God is glorified in my satisfaction; seeing God glorified increases my hunger and thirst for His righteousness. It doesn’t matter what I’m doing – changing diapers, talking to my neighbor, cleaning house – if my hunger and thirst are being filled by Christ then God is being glorified. Contentment is not the natural state of my heart. I am constantly falling prey to the illusion of the American life that is based on materialism and consumerism (another post for another time). Contentment is a daily – even hourly – concious choice that has to be made, but if I can keep my eyes on Christ I can constantly and actively be filled to satisfaction. It hasn’t been a week very conducive to blogging (read: I couldn’t think of anything that seemed to be worth anyone’s time to read). Little and I made a trip to my parents’ house the first part of the week to visit with my brother, SIL, and nephews. We had lots of fun and enjoyed getting to spend time with my brother and his family; we don’t get to see them very often. Anyway, since I don’t have much of interest to say right now, I will leave you with another meme about my Bookish tendencies (I’ve seen this one a few places including Rocks in My Dryer and Baseballs and Bows). I will be back next week and will, hopefully, have something worth saying. Keep, throw away, or sell? First, I must say that I can’t believe there are people out there who throw away perfectly good books. When we lived near a good used bookstore I would sell; mostly I try to only buy books that I would like to keep. Keep dustjacket or toss it? Keep it – there is a reason that printers put dustjackets on books, the spine is usually too ugly to stand on our shelves. Harry Potter or Lemony Snicket? Harry Potter, definitely. I tried to read the first Lemony Snicket book and just couldn’t get interested. I’m sure you have seen the e-mail forward that says friends come into your life for a reason, a season, or a lifetime. I can name several people who have been in my life at one time or another that fall into the reason or season categories. There are only a very few people that I consider lifetime friends. A lifetime friend is someone who is always there. You might lose contact for awhile, you might not see or talk to each other for several years, but when you do meet again your friendship picks right up where you left it. It is comfortable to reconnect with a lifetime friend; it is satisfying somewhere deep in your soul to have this person in your life again. These are the friends that you miss deeply when they aren’t actively a part of your life; the friends you dream about; the friends that pop into your thoughts when you least expect it. My friend Pat is a lifetime friend. She and I have been friends since I was a child. This wasn’t your typical childhood friendship, though; Pat is about 20 years older than I am. She has pictures of me in Sunday School when I was 2 or 3 (she was my teacher), and she has pictures of me at the beach with her children when I was 15 or 16. She was one of the first people (besides my roommates) who knew I had kissed Matt, and she made our wedding cake 4 years later. I baby-sat her children and she was at my baby shower. When I was about 10 years old I started spending a lot of time with Pat and her family. She had just had her first child and had recently moved into the house she and her husband were building. I remember being at her house before it had baseboards, interior doorknobs, or a porch. I remember both of her children as infants (they are in high school now, the oldest is a Senior – that makes me feel old!). I remember laughing together, singing together, watching movies together, cooking together, and eating together. I was at her house at least 1 weekend per month for several years. In my Junior and Senior years of high school I spent less and less time with Pat; when I started college I only saw her for a few minutes here and there. After I got married and moved away we pretty much lost contact all together. Pat e-mailed me again not long before I found out I was pregnant with Little; I was so happy that I was able to share that time of my life with her. Pat and I had a lot of fun over the years – more memories than I could ever record in one place (and more than anyone but me would care to read) – but she also taught me a lot about life and about loving God. Her house was a safe place for me to share all of those things that a young girl sometimes has trouble sharing; we talked about friends, about boys, about the past, and about the future. Over the years she showed me so much of her heart for God – both in conversation and in action; she’s had a true and lasting influence on my walk with Christ. I am blessed to call her friend. I pray that my daughters will have friends like this; women who take interest in their lives and walk beside them through the rough years of middle school, high school, and beyond. I pray that I can be “Pat” to someone’s daughter. I love you, Pat, and I will always cherish our friendship. Many of you know that I am something of a voracious reader; my habit has been slowed a bit by Little’s arrival, but I still knock out a few books a month. So, I was surfing around the other day and came across the following book meme on Ice Cream Mama’s blog and thought I would see how I stack up against this list. I would enjoy hearing which ones you’ve read (and enjoyed or not) and any suggestions for books you think I might like. Look at the list of books below. *leave blank the ones that you arenÃ¢â‚¬â„¢t interested in. You are currently browsing the Sidetrack'd weblog archives for March 2007.